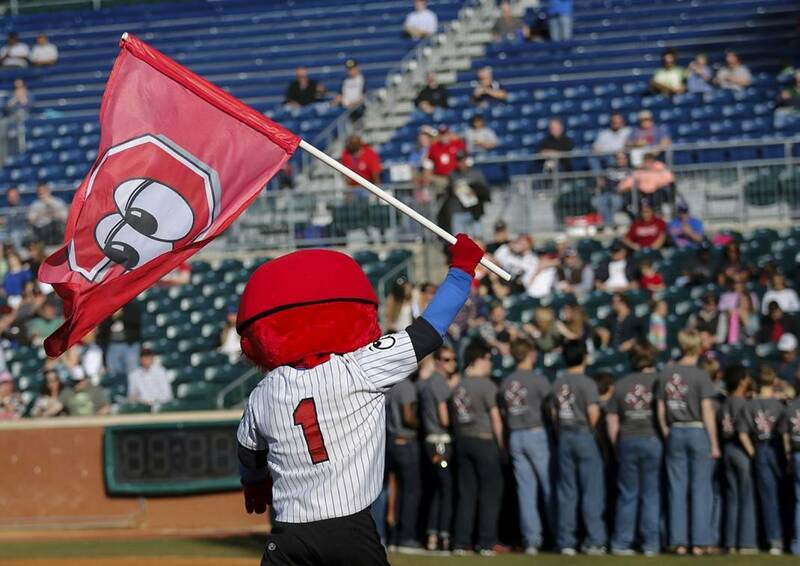 Chattanooga Lookouts mascot Looie watches as the Chattanooga Boys Choir sings the national anthem before the team's home opener at AT&T Field this past season. The stadium, built before the 2000 season, is the third-oldest in the Southern League. "Beacon Center Issues Warning on Potential Chattanooga Lookouts Stadium," the subject line read. Do what? What's happening? Is there a bomb scare? A hostage situation? Shortage of beer? No, the email detailed the Beacon Center's pre-pre-pre-pre-emptive strike toward the talk of a new stadium. Here's how the email was constructed: Three paragraphs, two of them quotes from Beacon spokesman Mark Cunningham, with the warning "of tax dollars going to any sports team." "Using taxpayer money to fund a privately owned sports team is both morally wrong and a poor investment for taxpayers. When millionaire franchise owners and developers seize tax dollars to fund their private businesses, taxpayers are the real losers. Time after time, stadiums have proven to be big losers for taxpayers, but politicians keep handing out taxpayer money to these corporations like candy. The Beacon Center is committed to standing up for Chattanooga taxpayers against politicians and millionaires trying to use tax dollars as their own personal piggy bank." Hey, this side of the media and the bogeyman, there is no bigger villain than politicians and wasted public money. Booooooo. A hoax on your house. Cunningham went on to note, "Sports stadiums are like a reverse Robin Hood, forcing lower-income taxpayers who can't afford to attend games to subsidize wealthier ones who can. Government should never take from the poor and give to the rich." Side question: Isn't that exactly what the Tennessee Lottery is for all intents and purposes? Also, this seems like a fair place to mention that Lookouts ticket prices have remained flat — and less than a movie ticket, by the way — for going on a decade. "Even worse," Cunningham continued, "owners often take the money to build a brand new stadium and then hold taxpayers hostage years later, threatening to leave the city if they aren't given more money for upgrades or a new stadium altogether. The city of Chattanooga should refuse to spend taxpayers' hard-earned money on a minor league baseball team, and instead use this money to pay for vital services like roads, police, and infrastructure." Sure, roads, police and infrastructure are important. But the nuts and bolts of governmental spending can't be limited to just the basics, especially for a city government that is not on the hook for public education spending. To be clear, there are no "Lookouts" or "Stadium" expenditures in Mayor Andy Berke's budget for the upcoming fiscal year. And, when contacted by this paper's Mike Pare, Cunningham admitted that he is unaware of any talk or proposals about a new stadium; the news release was a forward strike. A forward strike that, granted, is not farfetched and more than likely will be a discussion we as a city will need to have sooner rather than later. Lookouts owner Jason Freier manages a group that owns three minor league teams. In each of his two previous stops, franchises in Savannah, Ga., and Fort Wayne, Ind., asked their municipalities for lots of help in building new venues. Fort Wayne complied. Savannah did not, and the Sand Gnats moved to Columbia, S.C. This discussion will come sooner rather than later, considering AT&T Field is the third oldest stadium in the Southern League, is about to complete its 18th season and in truth has a shelf life that likely is real close to five years. Freier, the CEO of Hardball Capital that owns the Lookouts, told this paper's David Paschall last October there are certain design flaws with the current park, chiefly the positioning of the stands and the summer sun. Freier told Paschall: "The commitment we made when we came in was to get in and roll up our sleeves and understand the Chattanooga market well before we can make a decision as to whether it is something in the relatively near future or the much more distant future. I think we've started to understand the Chattanooga market, but I don't know that we're all the way there yet." The market and the discussions are, in most of these cases, pretty universal. Do you want a baseball team? If so, what are you willing to help that team with? To be fair, Hardball Capital put up sizable private investments in the new stadiums in Fort Wayne and Columbia. And make no mistake, when — not if — this comes to discussion, if we as a city are not willing to entertain the talk, there will be several cities looking to capture a minor league team. Is it coming? Likely. Is it worth debating right now? Most likely not, but if Cunningham wants to jump-start the conversation, then let's. The Lookouts have been a valuable part of the downtown turnaround. That said, we agree with Cunningham that a new baseball-only facility — AT&T 2.0 — built in some adjacent or nearby complex would be a waste of $30-35 million. AT&T is fine. Is it good? No, not really, and it's about to age in dog years in the eyes of the Hardball Capital folks. But imagine what a new park could be. Could it be the anchor of a nine-figure mega-center at the mouth of the Southside entrance to the city? Would that require a commitment from our city and county leaders? Would that be something that would craft the next narrative of expanding downtown renovation? Well, that's for us to decide, be it through referendum or special tax votes or what have you. It's certainly not something we need a think tank in Nashville to start a campaign against before we even start having discussions. Personally, I would be willing to listen to the plans and pitches for public funds working with Hardball's investments and other private money to assemble the mega-plex, because I know what downtown and the Lookouts have meant to this town. I also know we need more than bike lanes and paddle boarders as we look to the next 25 years of being a destination. I love the Lookouts and that experience, and would hate to lose that. But I love Chattanooga more, and I would certainly hate to have some focus group from the midstate pre-emptively sway a conversation that has not even been brought to the table yet. Contact Jay Greeson at jgreeson@timesfreepress.com or 423-757-6343.